A bootable installer is one of the fastest ways to install Mavericks. Rather than copy the installer to a local drive you can run it right off a USB disk (or Thunderbolt if you dare). Such a little USB drive would be similar to the sticks that came with the older MacBook Air, when we were all still sitting around wondering how you would ever install the OS on a computer with no optical media or Ethernet otherwise. Luckily, Apple loves us. To make a bootable USB/flash drive of Mavericks like the one that used to come with the MacBook Air, first name the USB drive. I’ll use mavinstall for the purposes of this article. The format should be Mac OS Extended Journaled. The installer is called Install OS X Mavericks.app and is by default located in the /Applications directory. 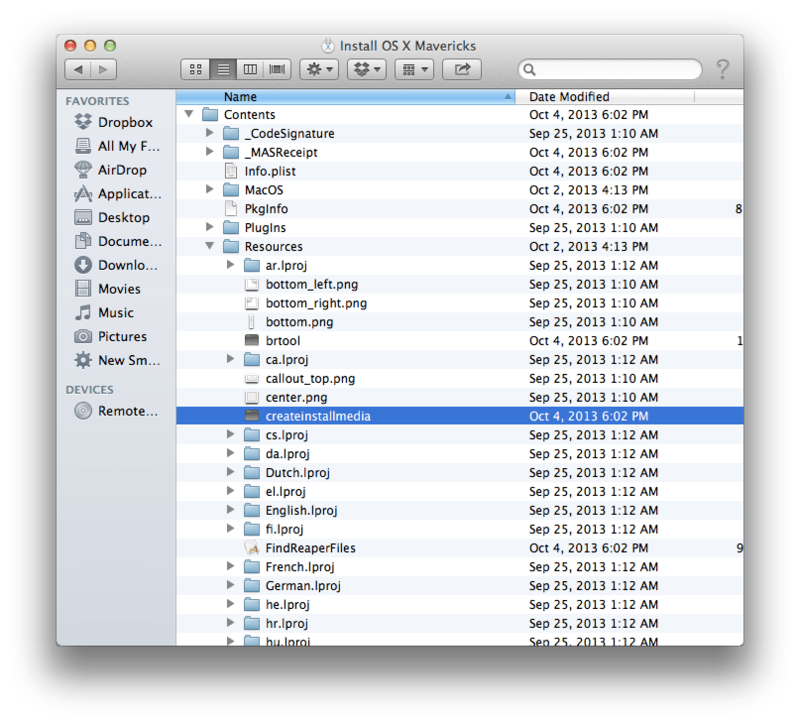 Inside the app bundle, there’s a new binary called createinstallmedia (nested in Contents/Resources). Using this binary you can create an installation drive (similar to what we used to do with InstallESD). To do so, specify the –volume to create the drive on (note that the target volume will be erased), the path of the Install OS X Mavericks app bundle and then we’re going to select –nointeraction so it just runs through the whole thing /Applications/Install\ OS\ X\ Mavericks.app/Contents/Resources/createinstallmedia --volume /Volumes/mavinstall --applicationpath /Applications/Install\ OS\ X\ Mavericks.app --nointeraction Note: You’ll need to elevate your privileges for this to run. Once run you’ll see that it erases the disk, copies the Installation materials (InstallESX, etc) and then makes the drive bootable, as follows: Erasing Disk: 0%... 10%... 20%... 100%... Copying installer files to disk... Copy complete. Making disk bootable... Copying boot files... Copy complete. Then you can either select the new volume in the Startup Disk System Preference pane or boot the computer holding down the option key to select the new volume. Note: If you can do this on a system with a solid state drive it will be faster. Although this took 17 minutes last I ran it even then so be patient for the files to copy.